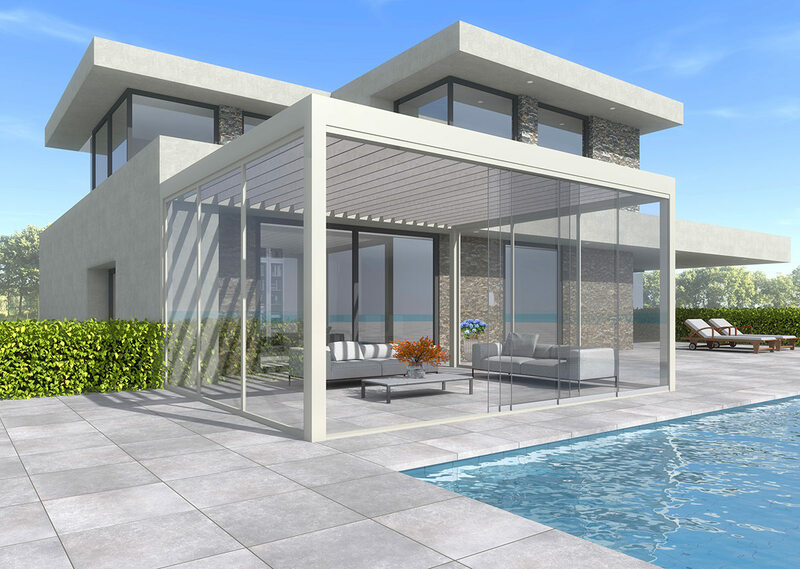 Embrace outdoor living the whole year round with Pallazzo’s incredible remote controlled motorised blade system which allows you to adjust the roof for solar shading, ventilation, illumination and rain protection depending on the season. The pergola can be designed to cover your terrace and extend the living area of your home, or create a luxury space anywhere in your garden with its robust freestanding configuration. Pallazzo combines perfectly with our optional glass walls, sliding doors and integrated LED lighting, so your new relaxation spot, garden lounge or barbecue space can be enjoyed through the evening and into the night. 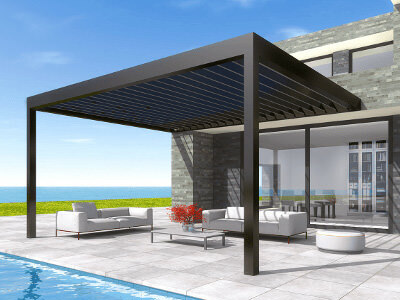 The bioclimatic pergolas can redefine how you see your outdoor living space. With stunning slim sightlines, add a touch of class to your garden with our luxurious, flawless ALUK Pallazzo. Transform the look of your home with our stylish pergolas designs for a luxurious relaxation space. Using cutting edge technology and an effortless design exceeds modern techniques with high performing, remote controlled, motorised blade system integrated into the roof. Adjust between solar shading, ventilation, illumination and rainfall, to create the perfect balance throughout all weather conditions. With a vast range of customisable options, you can bespoke design your pergolas. Create a stunning focal point to your garden with glass walls, sliding doors, radiant heaters, privacy blinds and integrated LED lighting. Innovative modular systems to give you the freedom to create the outdoor living area of your dreams. Designed to either enclose your terraced area, extend the living space in your home or build a relaxing outdoor space for your garden. Either way, create a stunning addition to your garden and enjoy elements of the indoors while being outdoors. 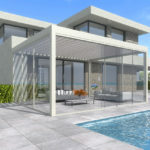 Design your pergola to avoid interrupted views with the addition of glass walls and glass sliding doors. Highly weatherproof, the ALUK Pallazzo can be custom designed with a unique bioclimatic roof that opens in summer months and closes during the raining seasons. The ALUK Pallazzo enhances the style and sophistication of your home through its visually appealing aesthetics. Modernise your home with an eye-catching extended living space. Complete with full aluminium construction, our pergolas are designed to last. They make a worthwhile investment for your home, combining high quality design with modern appeal. Take a look at our videos that show why the Pallazzo is such an excellent choice. 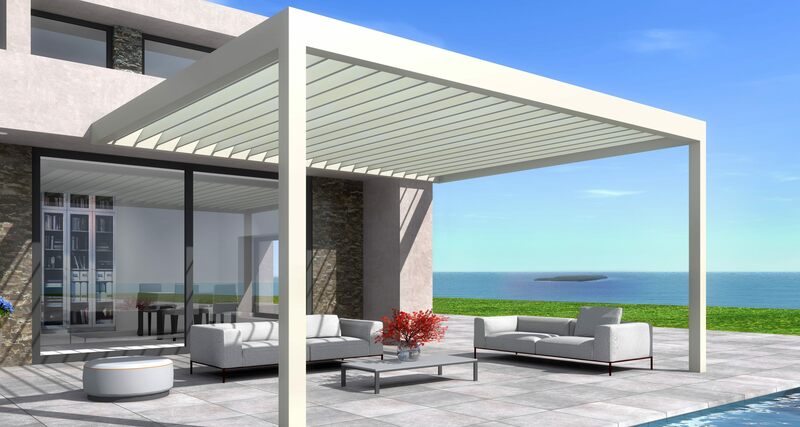 Capture a truly seamless design with slimline, stylish aesthetics that our pergolas offer. Add an outstanding addition to any contemporary style of home and tailor finish to your style, space and budget. Opt to bespoke design your pergolas in a vast range of colours, finishes and customisable options. Add a modern flair to your traditional home. Every detail of the bioclimatic pergolas is considered when it comes to the design of our ALUK Pallazzo. Each aspect designed and created in a way that suits your taste while providing enhanced performance to your home. Design a living space that truly creates the perfect atmosphere for your home improvement needs. Add integrated glass doors, glass walls, LED lights, privacy blinds and radiant heaters to ensure you can enjoy your pergolas all-year round. With a unique bioclimatic roof, you can provide ventilation to your space while still providing shade from the sun. Alternatively, this roof allows for protection of your outdoor area when necessary. Take a look at the brochure below which is available as a download. In this brochure you’ll find the technical specifications for the Pallazzo. 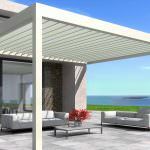 The Bioclimatic Pergolas is an effortless product that pushes the boundaries of modern technologies. Our uninterrupted views from our pergolas are a beautiful addition to any style of home in the UK. With their versatile nature, you can use them to serve as a wide range of purposes for any outdoor living space desire. When it comes to the installation of the ALUK Pallazzo, we ensure a prompt installation to reduce the construction time. Minimising the disruption to your daily schedule in your London home, our bioclimatic pergolas have been designed for fast and simple installations. Combined with a fully mechanical assembly method that allows for simple and easy transportation. Our premium grade aluminium pergolas outclass any timber or uPVC alternative. 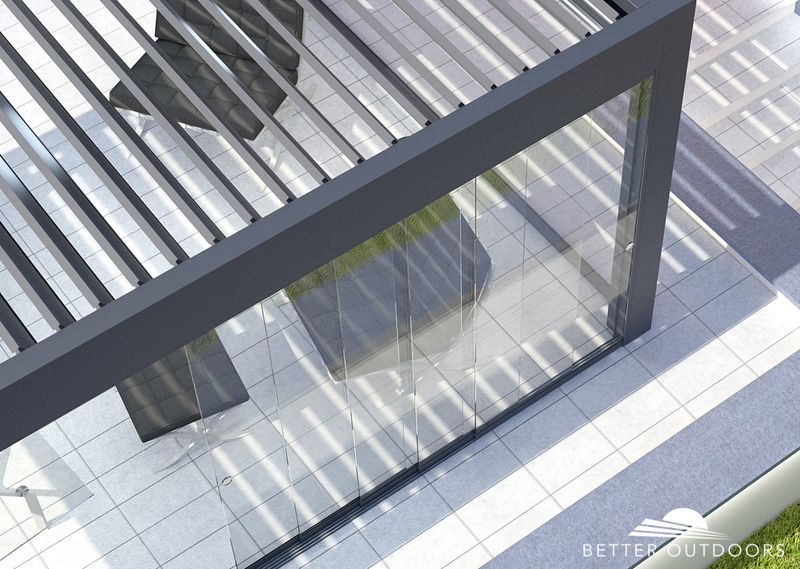 Far superior lifespan and low maintenance requirements, aluminium is the perfect architectural material for products with exposure to the outdoors. Eliminate any risk of rusting, rotting, warping or cracking from timber or steel alternatives with aluminium construction. 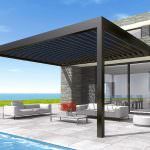 Tailor design your bioclimatic pergolas with a durable polyester coating. Available in 7 selected colours as the standard, including contemporary colours such as white, grey or black. Choose to custom finish your ALUK Pallazzo with a mix of metallic, matte or gloss. All our pergolas colours help to provide a sleek finish that offers an attractive look. You can contact us today for a free quote for your aluminium pergola. Simply visit our contact page and fill out our online contact form. A member of our expert team will be able to answer any questions you may have. We are happy to recommend or advise on the most suitable products for your needs and requirements. How can I make my ALUK Pallazzo bespoke with walls and doors? Custom design your pergolas with beautifully transparent full-glass sliding doors for unobstructed views. Close off one or more sides of your pergola without spoiling the stunning views with glass walls. Will my ALUK Pallazzo provide year-round performance? With the addition of modern, elegant electric strip heaters that are designed and weathersealed you can enjoy your pergolas all-year round. Producing a radiant heat for both people and surfaces. Your glass walls can also contain a thermal film that transforms the entire pane into a transparent thermal heater. Can I add lights to my pergola? Enhance your bioclimatic pergolas with a continuous strip of highly efficient, dimmable LED strip lights. Operate using a remote control or by your smartphone app. Can my pergola be designed for privacy in my garden? 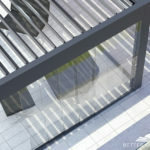 Our robust, motorised external blinds from leading German manufacturers can create a privacy shield for your garden. The vertical blind can protect the pergola from weather conditions such as wind and add a sense of privacy without blocking all natural light. How can I operate the lights and roof of the pergolas? Operate your bioclimatic roof, LED spot lighting and heating with an optional remote control. This controls the roof by enabling opening, closing and adjusting of the roof blades. With the addition of a rain sensor, you can close your pergola roof when it detects rain, ensuring your furniture and garden is protected from the rain.